We are Ireland’s trusted name in Locksmith & security solutions — providing you with 24 hour emergency, residential, commercial and auto locksmith services. We have Locksmiths based in Dublin, Cork, Galway and Wexford ready to assist you 24/7. We provide a 24 hour emergency locksmith service, so no need to worry if your locked out or if you have lost your keys, all you need to do is contact us and leave the rest up to one of our locksmiths. All our mobile locksmiths carry the right equipment to get you out of any situation and back to what you were doing fast. Are you somewhere in Dublin, Cork or Galway and locked out of your car? If you answered yes, than you are in the right place. We have skilled locksmith technicians that provide you with top quality auto locksmith services to help get you back in your car instead of being stranded. Lost your car keys? Need them replaced or copied? That’s business as usual here at Irish Locksmiths where we are equipped to handle any car locksmith requirements 24/7. 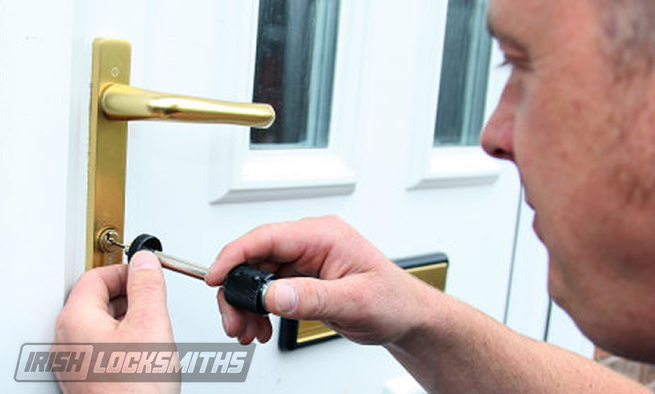 So if you are locked out, contact us now, and we will have one of our locksmiths dispatched in 10 minutes. We use approved tools that do not damage the vehicles or leave any marks whatsoever. If you’ve been burgled, chances are that your windows or doors have been damaged during the process. You will have to repair those windows, doors and security fittings. That’s where we step in. We know any type of burglary to your Home, Business or Vehicle can be traumatic to say the least but you will need to put plan into place to stop it happening again. We are a nationwide locksmith company with fully trained and vetted Locksmiths based in each country of Ireland. Please select your preffered location below to be put in touch with your Local Locksmith.